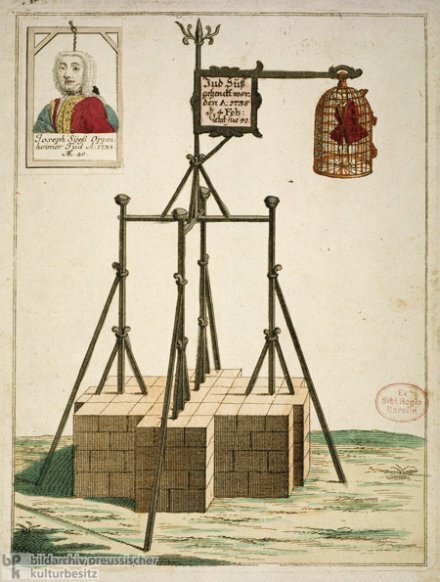 On this date in 1738, the Jewish banker Joseph Suss Oppenheimer was hanged in a metal cage at Stuttgart — overthrown by rival courtiers after the death of his ducal patron. Oppenheimer steered the finances of Duke Karl Alexander, amassing a fair fortune and a crop of enemies in the process. Oppenheimer was a faithful servant of his prince and of the state, and was intent in every way upon the welfare of both, for which he deserved the thanks of all. Since instead he was persecuted by envy and ill-will to such an extent that attempts were even made to bring him into disfavor with the duke, the latter accorded him his especial protection and expressly forbade the continuation of such attacks. But weeks later, the Duke died unexpectedly — and that ill-will immediately poured out upon his minister. Oppenheimer copped under torture to all manner of crime, but he stood by his faith, refusing even at the brink of the gallows to convert in exchange for his life. His body remained gibbeted for six years; the Jewish community was expelled (although only briefly) following his hanging. Most recently — and far more sympathetically — a 1990’s German chamber opera by Detlev Glanert re-adapts the story. Wow it’s tough to get accurate information on this episode. The Jewish Encyclopedia you quote is what would be called a “white wash”. Oppenheimer was an opportunistic climber, yet portrayed passively in the service of the Duke. Even makes much of feigned resignations. The small fortune accumulated by Oppenheimer should clarify his intent. The encyclopedia attempts both to credit Oppenheimer with improving the Dukes finances with his “ideas”, but when these ideas are found unsavory and unjust, the encyclopedia attributes them to the Duke! The piece begins asserting the Duke needed Oppenheimer but evidently the Duke had the ideas all along. A little critical reading tells you the story isnt quite as its being told. The “ideas” appear to originate with Oppenheimer, they appear to be new, unfamiliar impositions and considered unjust by the populace. And it appears Oppenheimer had a practice of splitting revenue with his Duke, keeping a portion for himself. He also appears to have been openly discriminatory, granting monopolies to his co-religionists. The Nazi film is panned in its narrative save for the one scene that accuses the Christians of racism, an unreliable source save for when it’s reliable. The common practice of worrying about the souls of the executed is held up as proof of racism. The more a reader looks into the actual policies Oppenheimer put in place, the lower in esteem one holds Oppenheimer, rather than describing him as a great success in “improving finances”. The letter of recommendation by his co-conspirator the Duke should be laughed off the page. The Jewish Encyclopedia is not so encyclopedic in its representation. Dear Jason, thank you very much for this interesting post. The name Oppenheim(er) ist still a well known and glamourous name in Germany’s private banking sector. Sal. Oppenheim & Cie. is probably the most respected and well known bank in private (family) hands. I am convinced that Oppenheim and Oppenheimer are two branches of the same family, as both seem to have their roots in the city of Oppenheim, Palatinat, southwest Germany. The region where I was born as well.